1. Ask Elsie and Emma: On Time Management by A Beautiful Mess. 2. Balance: Tips For Scheduling a Productive Week by Maiedae. 3. Coffee Cup Chats: The Unbalancing Act (Part One) by Life as an Artistpreneur. What have you found helpful in balancing life? 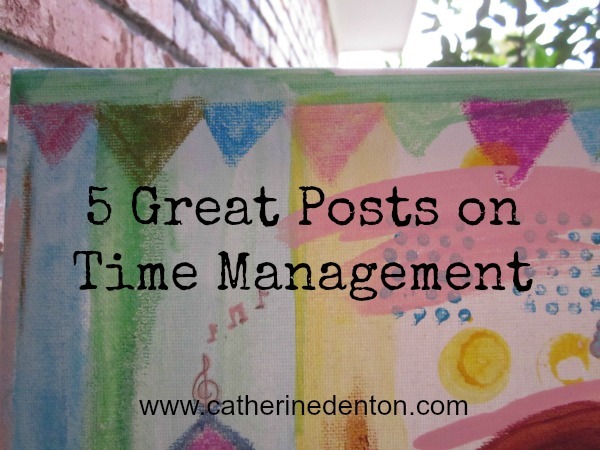 Catherine: Time management is my greatest strength. I am a guy prone to a lifetime of adventures, but I learned early on to get the most out of the hours I am given. Those who know me laugh because I tell everyone "I don't believe in time." I don't. In my view, time is an arbitrary concept created by man to measure stress. We all have 24 hours from sunrise to sunrise. How we prioritize those hours determines what enjoyment we can cram into our lives. I try to accomplish twice as much in half the time, and take more free time for myself and my family every month than many people do in a year. Time management is everything. Good for you! I'm still learning how.